Santa Muerte is a sacred figure and feminine skeletal folk saint venerated throughout Tayxis. Santa Muerte literally translates to "Saint Death" or "Holy Death". Tayxan culture has always maintained a certain reverence towards death, so it was only natural that Santa Muerte would make it it's home. Elements of worship include the use of skeletons to remind people of their mortality. The worship is condemned by the Official Church of Tayxis (OCT) as heretical, but it is firmly entrenched among Tayxis' lower working classes and various elements of society deemed as "outcasts". Santa Muerte generally appears as a female skeletal figure, clad in a long robe and holding one or more objects, usually a scythe and a globe. Her robe can be of any color, as more specific images of the figure vary widely from devotee to devotee and according to the rite being performed or the petition being made. Shrines can be found all around Tayxis, with skeletons propped up, covered in the gifts her supplicants have left her. She has been known to intercede in the lives of her worshippers, offering boons to the faithful, holding back death from loved ones, or striking down those who have offended them. However, Santa Muerte will often demand outrageous gifts or acts of devotion simply to gain the privilege of asking favor, and she will either grant or deny requests, seemingly without rhyme or reason. Santa Meurte is often invoked by Cartel Assassins, who will leave tokens at the sites of their killings. There are a small sect within The Pigs that worship her, as well. Big Oil Men have been known to strike bargains, when it was in their best interests to do so. While there is some commonality between Santa Muerte and Santeria, the Santeria Priestesses consider cults that worship Santa Muerte exclusively to be somewhere between Tasteless, Blasphemous and Pointless. Should the PCs encounter a shrine to Santa Muerte, they can make a request of her. There is a base chance that the request will be granted, depending on the but the odds will increase by 10% each time the PC completes a task that Santa Muerte demands of the PCs, determined randomly by rolling on the chart below. 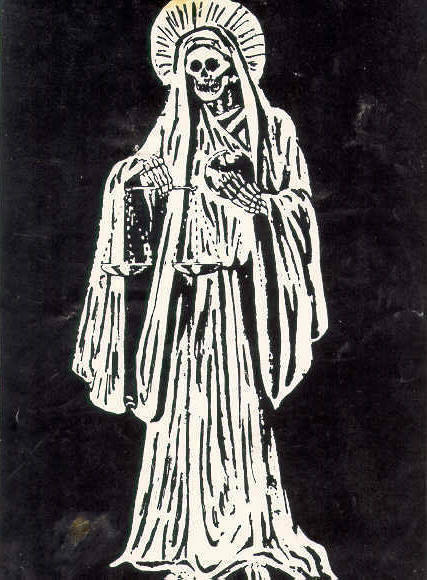 Death’s Head – Must accept a small part of Santa Muerte into their mind that will constantly urge them to kill. Trying to Catch the Devil’s Herd – Must round up 50 head of wild cattle on an open plain and surround them in a ring of fire.